Big Hero 6 has a big something for everyone. To be honest, I am not a huge fan of superhero movies. Animated movie musicals like Frozen are more my thing. Big Hero 6 surprised me. Big Hero 6 is very loosely based on the Marvel Comics superhero team by the same name. The movie version of Big Hero 6 (directed by Don Hall and Chris Williams) follows 14-year-old child prodigy, Hiro (pronounced: Hero) Hamada, who lives in a futuristic, fictional mash-up of San Francisco and Tokyo (called San Fransokyo). Like many Disney heroes, Hiro has lost his parents and is struggling to find his place in the world. Just when Hiro thinks he’s found it, another tragedy befalls him. When a possible cause for the tragedy is revealed, Hiro joins forces with a huggable robot named Baymax and a group of science geek friends to form a band of smart superheroes called Big Hero 6. Together, they go after the mysterious culprit. The overall plot of Big Hero 6 vaguely reminded me of the Scooby Doo cartoons that I used to watch as a kid, complete with a masked bad guy (in Big Hero 6, the bad guy wears a kabuki mask); some of the heroes of Big Hero 6 even bear a minor resemblance to members of Scooby’s gang in both physical appearance and personality. Hiro (voiced by Ryan Potter) immediately captures the heart. He is both lovable and smart. When Hiro’s life is shattered, it’s impossible not to hurt for him. But the real star of Big Hero 6 is Baymax (voiced by Scott Adsit). 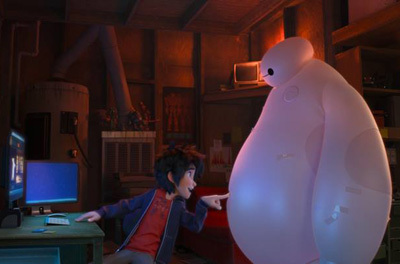 Baymax, the product of the imagination of Hiro’s older brother, is a huge, squishy robot programmed to help people monitor their health. It is easy to compare Baymax to Frozen’s snowman, Olaf. On the surface, the two look and act similar (perhaps the people at Disney planned it that way), but Baymax quickly becomes his own character, with a surprising amount of emotional depth, especially considering that he is a robot. As a physician, something that I really appreciate about Big Hero 6 is that the movie portrays science as cool, which it is. For the most part, I found the medical aspects of the movie to be close enough to reality as not to be too distracting. Unfortunately, medical professionals will cringe rather than laugh when Hiro tells Baymax, “You gave me a heart attack,” and Baymax’s response is to activate his defibrillation paddles and announce, “Clear.” Baymax seems ready to shock Hiro with electricity until Hiro tells him, “Stop. It’s just an expression!” I understand that this is an animated movie, but that’s just scary! This problem could have been remedied (with the same overall effect) by having Baymax say instead, "I will evaluate your heart rhythm. Clear!" There are a few inconsistencies in Big Hero 6, like the fact that Hiro leaves a valuable prototype seemingly unattended just minutes after it was nearly stolen. Why not add a moment where Hiro locks up the prototype in his brother’s lab to keep it secure? The ultimate outcome would have been the same. Another thing that puzzled me: not long after Baymax patches some wounds on his arms with a police officer’s Scotch tape, the Scotch tape pieces mysteriously disappear and Baymax is as good as new. How did that happen? There are no real laugh-out-loud moments in Big Hero 6, at least not for adults, although Baymax and Fred (Hiro’s friend and one of the Big Hero 6 superheroes; voiced by T.J. Miller) do offer some funny moments. The movie does, however, tug at the heartstrings. If you cried when the gang in Toy Story 3 held hands in the incinerator, bring tissues to Big Hero 6. 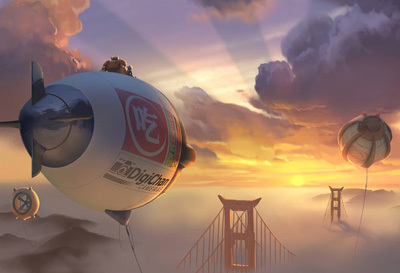 Where Big Hero 6 truly shines is visually. Stunning isn’t a strong enough word to describe Big Hero 6. The imaginative, dazzling city of San Fransokyo comes alive on the screen. It feels remarkably real in a way that I haven't seen before in an animated film. The visuals of Big Hero 6 are so spectacular that the movie absolutely MUST be seen on the big screen. I saw Big Hero 6 in 2D, but seeing it in 3D would no doubt be a treat. Altogether, Big Hero 6 is easily the best animated movie with both kid and adult appeal since 2013’s Frozen. The movie has enough heart, action, adventure, and cool science to appeal to boys, girls, men, and women. Most everyone who enjoys animated movies will have a good time watching this one. When you do go to this movie, don’t leave the theater until you catch the fun surprise scene after the credits. And don’t be late to the movie or you’ll miss the adorable pre-show short, Feast, about the love of a dog. The movie ends leaving the possibility of a sequel. If Disney does make a sequel to Big Hero 6, I will come back for more. I’m sure that I will not be alone. Big Hero 6 opens in theaters November 7, 2014. Big Hero 6 is rated PG. * Jen attended a complimentary screening of Big Hero 6.